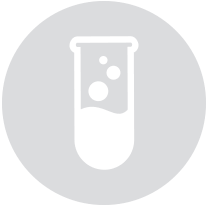 Due to the variability within patient samples, different blocking strategies are needed to dilute samples to achieve maximum assay performance. 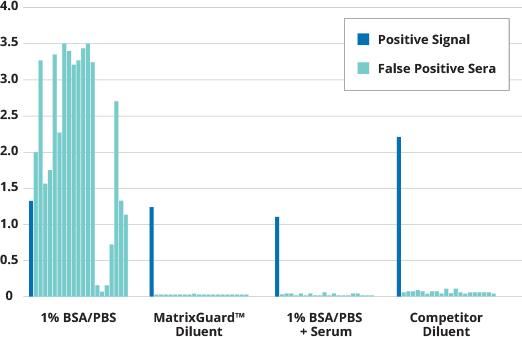 Both MatrixGuard™ Diluent and Surmodics® Assay Diluent (Protein-Free) are the gold standard for reducing false positives in your assay. 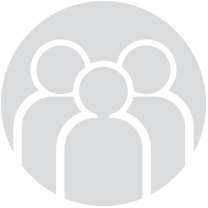 Both formulations provide two options to use when different methods are needed to block matrix interferences, while maintaining the clinical utility of the assay. 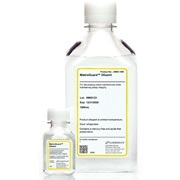 MatrixGuard™ Diluent provides outstanding reduction of false positives in a customer assay. 50 ul of buffer (as defined on the graph) containing the customer’s detection antibody was added to the wells of antibody coated 96 well plate. Immediately 100 ul of sample (Positive, False Positive, Negative) was added to each well and incubated for 1 hour. The plate was then washed, Streptavidin-HRP was added for 30 minutes, the plate was washed and finally TMB was added to each well for color development. The graph shows the OD at 650nm recorded for each sample and buffer combination. 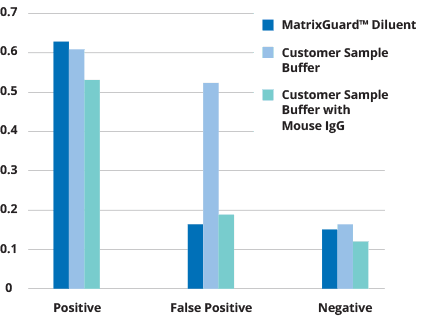 MatrixGuard™ Diluent outperforms the competition in maintaining a strong positive signal, while simultaneously reducing false positive sera. Pappalysin 1 assay was run with twenty serum samples that displayed false positive signals. 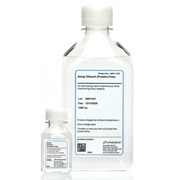 Fifty microliters of serum or positive samples were added to 100 ul of each assay diluent during the sample incubation step. MatrixGuard Diluent provides unsurpassed blocking whereby matrix interferences are effectively blocked while the intended assay signal is maintained. Surmodics protein-free assay diluent reduces matrix interference and provides accurate dilution recovery of patient specimens.